The Rowan women’s basketball team picked up steam on Saturday then quickly delivered the knockout blow against William Paterson University, coasting to an 83-70 win. 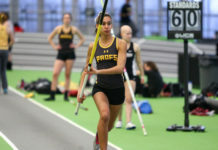 The result gave the brown and gold their second NJAC win of the season. 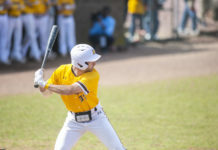 The Profs (6-1) never trailed, and continued to build their lead throughout the contest by setting the overall pace of play, leading by as many as 23 at one point. That sloppiness began to creep in during the fourth quarter. Trailing by double digits for much of the game, the Pioneers (4-3) matched their highest-scoring quarter to draw within 10 points in the later parts of the fourth. William Paterson hadn’t kept it that close since the first half. Initially, some of Rowan’s starting players got into foul trouble which helped William Paterson stay in it early. The fouls resulted in multiple free throw opportunities for the Pioneers. But the Profs were prepared for situations such as this. Even though William Paterson made 11 of their 14 free throws in the first half, Rowan’s defense held the Pioneers to only eight field goals on 30 attempts. The team went into halftime with a 46-31 lead. The defense played strong throughout the game, forcing the Pioneers to make a bevy of mistakes. The brown and gold scored 29 points off of 25 William Paterson turnovers. Sanchez played a big role in the Profs effort, contributing five steals out of the team’s 17. She also recorded her second double-double of the year with 20 points and 11 rebounds, and continues to lead the team on offense by averaging 17 points a game. In the team’s most recent game, a 65-58 win over The College of New Jersey, Sanchez collected her third double-double with 17 points and 13 rebounds. The win brought Rowan to a three-team tie for second in the conference with a 3-1 record. The brown and gold will next play Montclair State on Saturday. The Redhawks hold the first place spot in the NJAC.